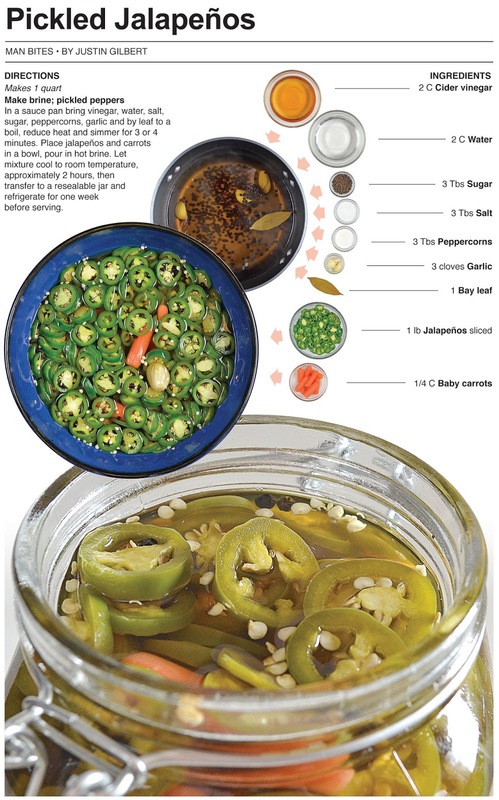 I’ll bet that many, if not the majority of Americans get there first taste of spicy heat with pickled jalapeños. I don’t know that for a fact, but it’s a cheap way to make things spicy and most Americans have been tempted at least once in their life to get their ballpark nachos (cheese sauce and tortilla chips) with a handful of pickled jalapeños piled on top. They were my introduction to spicy heat and I used to put them on about everything until my late twenties. That’s when excessive amounts of hot food started become uncomfortable for me to digest. I’ve found that as long as I don’t go overboard with quantity I can handle about any kind of spicy heat without being miserable a couple hours later. 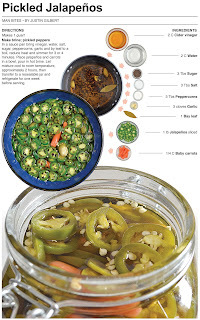 I had a plate of nachos with a few pickled jalapeños recently when I decided it was time to pickle a batch of my own for a post here. After making the brine for these I was letting it cool. While it was sitting out I got a good whiff. A few seconds later I had a couple of hard sneezes. That’s when I got exited. I knew they would be good if a breath of the brine alone could make me sneeze. As expected, they’re a great garnish for adding some heat to a dish and they have that homemade freshness to boot. 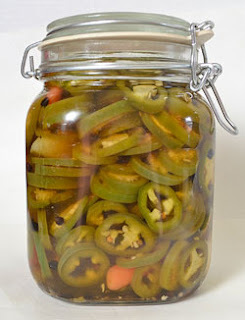 I was happy to document and make a pickled jalapeño recipe of my own. Near the end of the summer when gardens are being harvested I’ll use this for my print column. Starting in late July, there is an abundance of fresh stuff from home gardens around. Everyone has tomatoes and cucumbers and many also have jalapeños. This will be perfect for the paper when peppers start to get ripe. This is the second time I have made pickled hot peppers. Years ago I made a gourmet recipe from Bobby Flay. 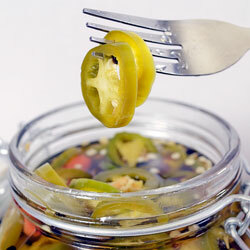 When I was finished I had what seemed like a 30 gallon drum full of pickled serranos and jalapeños. Had I kept the jar I would still be eating them today. Here's the irony. I made the entire batch for about two tablespoons worth of a garnish on a pork chop. I had no idea how much I was making until I was to far in to reduce the amount. When it was all said and done I spent 8 bucks on the pork chops and $25 on the pickled pepper garnish. In a sauce pan bring vinegar, water, salt, sugar, peppercorns, garlic and by leaf to a boil, reduce heat and simmer for 3 or 4 minutes. 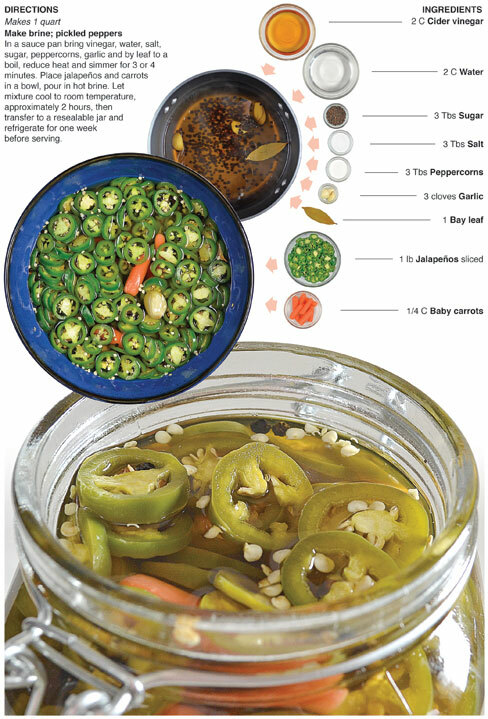 Place jalapeños and carrots in a bowl, pour in hot brine. Let mixture cool to room temperature, approximately 2 hours, then transfer to a resealable jar and refrigerate for one week before serving.